Earlier this month, Samsung unveiled the Note7, the latest addition to its Galaxy smartphone lineup. The Note7 builds on all the best features of the previous generation Note5 phablet and includes many of the new Galaxy S7's (GS7) top capabilities. After spending three weeks with the Note7, and using it every day alongside my iPhone 6s Plus, it's clear the Note is not only the best business smartphone Samsung has made, it's the best all-around phone the company has released. Ever. In many ways the new Note7 makes the iPhone 6s Plus look and feel inadequate. I write a lot of business-oriented smartphone reviews, and I’m always attempt to provide a balance of pros and cons for enterprises users. It's been a long time since I found it impossible to do so; the Note7 simple offers much more to love than to hate. The phone isn't perfect, however, and its few flaws can be significant. The Note7’s hardware design is near flawless, and I can't remember the last time I had such an overwhelmingly positive sensory experience the first time I touched a new phone. The phone looks so slick you're not going to want to use a protective case. The phone is a great size, and even though it's still considered a phablet, it's not as big or clunky as previous Note phones. In fact, it's only slightly larger than the GS7 edge, and it has a bigger, 5.7-inch display, compared to the GS7 edge's 5.5-inch screen. It's also relatively light for its size. For context, the Note7 is significantly smaller (153.5mm) and lighter (169 grams) than the iPhone 6s Plus (158.2mm and 192 grams), though it's also more than 0.5mm thicker. The Note7 has a water-resistance rating of IP68, which means it'll be just fine in up to five feet of water for as long as 30 minutes, according to Samsung. In other words, the phone should be well-suited for field workers who might have to work outside in the rain — and it should stand up to the occasional toilet dunk. However, it's a good idea to use a protective case on the Note7, because it's large screen is still prone to shatters. 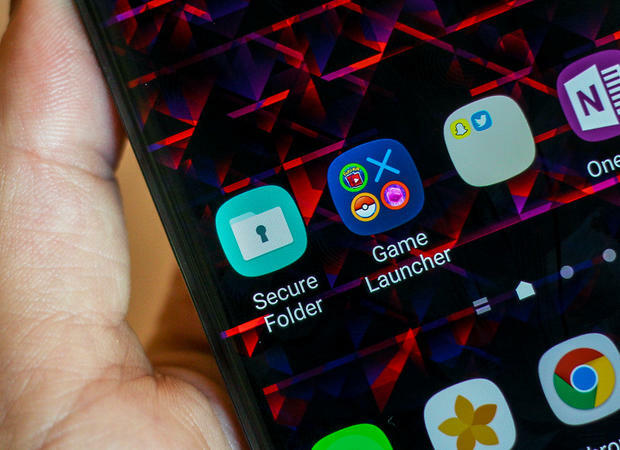 All of the latest Knox security safeguards Samsung has to offer are available in the Note7, and Knox integrates with many of today's most common MDM and EMM offerings. Knox also received the most "strong" ratings of any mobile security platform in Gartner's spring 2016 "Mobile Device Security: A Comparison of Platforms" report. A new "Secure Folder" feature lets you create a locked "container" on your phone that can't be accessed without authentication. It's essentially a more consumer-friendly version of Samsung's My Knox personal container feature. You can also choose to hide the secure folder, so the only way to access it is by drilling down into the secure folder settings. IT departments cannot disable this secure folder, but security-conscious organizations could choose to run the Note7 in "container only" mode, according to Samsung. Such a move would block the use of the secure folder, because the device can't run a secure container within another container. Finally, the Note7 lets you encrypt all content on memory cards, a simple feature but one security- and privacy-conscious users should appreciate. 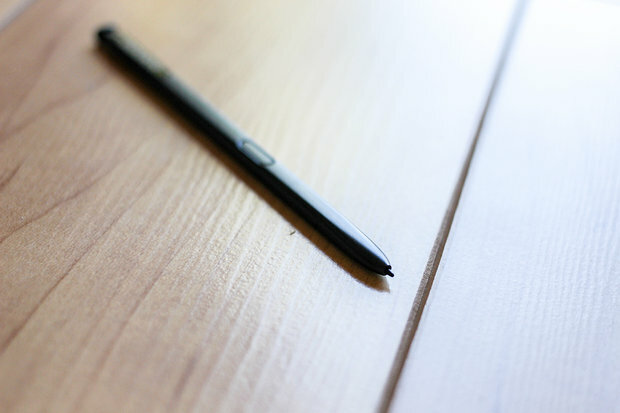 The Note7's "S Pen" stylus has more features than ever, and it feels even more like a ballpoint pen in hand and when you write on the device's display. The design of the S Pen is also slightly different, with the "Air Command" actions button higher up on the pen. Its pressure-sensitive tip is slightly smaller and more precise, according to Samsung. And the Note7 stylus is just as water-resistant as the device, which means you can write on-screen in the rain or even while the device is submerged in liquid. I tested the feature in a small basin of water, and it worked well. The device is the first Samsung Galaxy phone with a USB C port. USB C is the industry standard mobile port of the future, and it offers a number of enhancements, including faster potential data transfer rates and improved charging. And the Note7 comes with two USB C adaptors (one for regular USB and one for micro USB), so you don't need to purchase any additional components to use your current USB accessories — a very nice touch on Samsung's part, and one you'd never see from a company like Apple, which charges $19 for a Lighting to micro USB adaptor. 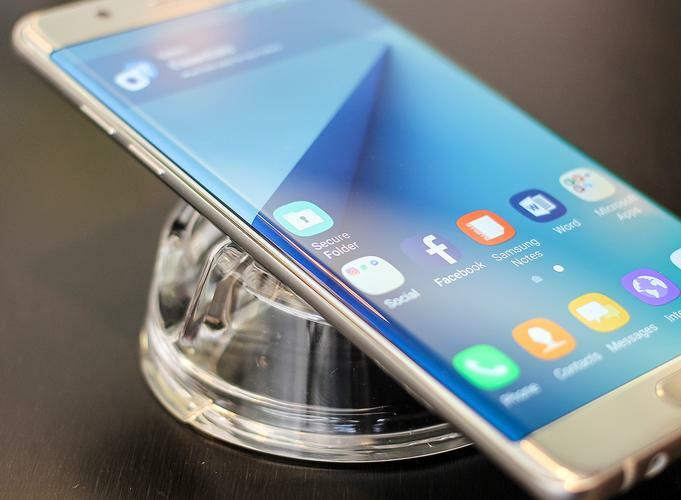 The new Note7's display is curved on both sides, just like the GS7 edge, and it has the same set of edge features. You can slide a thumb (or S Pen) from the outside of the screen in to pull up an edge panel, which lets you view two side-by-side columns of apps or contacts. You can also place app widgets from third parties on the apps edge to trigger certain functions. For example, you could place a 1x1 widget from a Twitter app on the edge screen and use it to go directly to the new tweet function, instead of using the app's icon to open it and then navigate to the appropriate page. The Note7 has the same resolution display as the last two generations of Galaxy S phones and the Note5: quad HD 2560 x 1440. In other words, the two-year-old GS6 has the same display resolution as the brand new Note7. That's not a bad thing, because Samsung screens are still some of the better displays available on mobile phones today, but it is notable. Samsung's "Always-On Display" feature lets you pick the information you want to show up on your screen when it's asleep, including date and time, battery information, calendar appointments, active apps and notifications. And you can customize the look of your Always-On Display. The 12MP rear camera on the Note7 is the same as the GS7 and GS7 shooters, according to Samsung. Image quality is good in brightly lit environments and in natural light but less so in dim or artificial light — a common issue with modern smartphone cameras. And the back camera actually has a lower megapixel count than the GS6 and Note 5, though it also has many other lens and camera enhancements that make up for the reduction in pixels. Samsung offers only one storage option for the U.S. Note7, 64GB, but it also supports microSD memory cards for expandable storage. It supports inductive wireless (Qi and AirFuel Alliance standards) and wired fast charging, which means you can power up more quickly using cables or charge pads. The Note7 uses the Samsung Pay mobile payments service for quick-and-easy phone-based payments at the majority of retailers that accept credit cards with magnetic stripes, thanks to its MST support. And it also has NFC for contactless payments. Samsung Pay works with many of the most common corporate credit cards, including American Express corporate cards, and it lets travelers make more secure transactions while on the road. That's a whole lot to appreciate about the Note7, whether you're an IT administrator, busy executive or frequent business traveler. But the phone isn't without flaws.